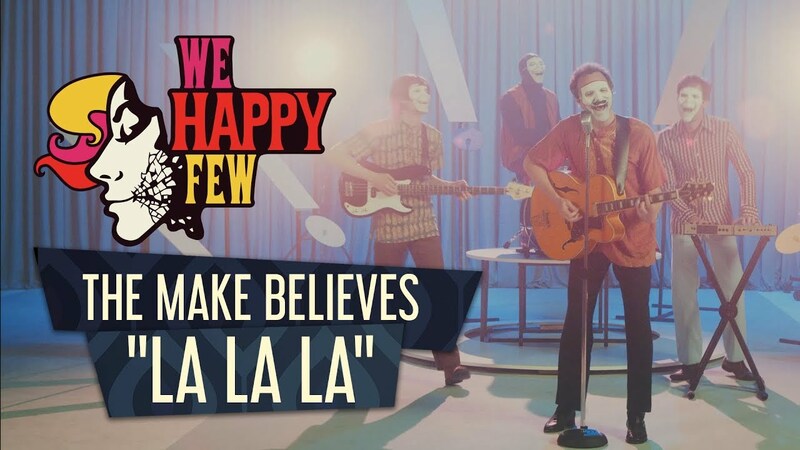 The best of Montreal’s music scene behind ‘The Make Believes’, a boy band project created by Compulsion Games and Signal Space Lab for the official soundtrack of We Happy Few. Indie developer Compulsion Games and the audio division of the studio Signal Space Lab brought together some of Canada’s most prominent names in the Montreal music scene to create “The Make Believes”, the band behind the authentic swinging sounds of the ‘60s for the upcoming video game, We Happy Few. The initiative, orchestrated with the support of Factor, successfully united the talent of Brad Barr & Andrew Barr (The Barr Brothers), Murray Lightburn (The Dears) and Patrick Watson to create a happy but unsettling album for the game. The idea was brewed up by creative director Jose Aguirre in 2015. After having received a nomination for best original music at the Canadian Video Game Awards with Contrast but not winning, Signal Space Lab took the challenge to create something extra special for We Happy Few. Although there was not much belief at the beginning that it would be possible to bring together such big names, the persistence paid off, and the resulting album is something the studio is exceedingly proud of. In addition, Nicolas Marquis, the senior composer of Signal Space Lab added 40+ fantastic in-game tracks. We Happy Few is available for Microsoft Windows, PlayStation®4, and Xbox One.